The more an SUV costs, the less likely you’ll see one crawling over rocks, fording streams and rolling off the beaten path—even if it could. Brands such as Land Rover and Jeep are masters of off-roading, and virtually every vehicle in their lineups could tackle just about any type of terrain. Jeep Wranglers? Oh yeah, you’ll spot many of them deep in the woods or escalading a mountain where they belong, and maybe a few Renegades, Cherokees and Libertys. But a Grand Cherokee? Not really, despite having all the necessary gear and abilities to do so. It’s curious to see Fiat Chrysler Automobiles add the 2017 Jeep Grand Cherokee Trailhawk to its product portfolio, as if it was something that was sorely missing for years. On the other hand, launching new versions of existing models is part of Jeep’s marketing strategy, and it has worked well so far. The Trailhawk does look good with its black hood stripes, red tow hooks, skid plates as well as black and red badging. It also includes Kevlar-reinforced Goodyear Adventure tires, although our test vehicle was rather equipped with winter rubber for the snowy season. It also gets mechanical features that help it become, as Jeep calls it, “the most capable Grand Cherokee ever.” The brand’s Quadra-Drive II system is standard in the Trailhawk, optional in other trims, and a full-time 4x4 setup that includes a rear electronic limited-slip differential and a low range. It also works in conjunction with the Selec-Terrain system that provides various settings depending on road conditions, chosen by the driver through a console-mounted rotary dial. Said settings include Auto, Snow, Sand, Mud and Rock. 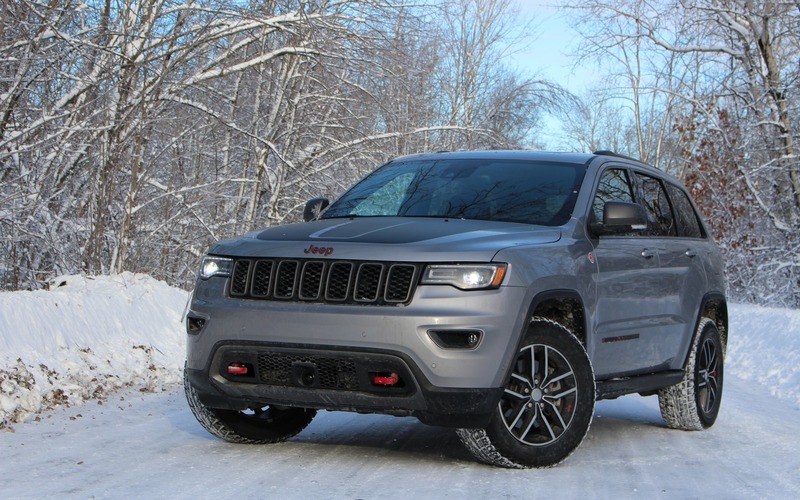 What’s the difference between Quadra-Drive II and Quadra-Trac II, which is also offered on the 2017 Jeep Grand Cherokee? QDII makes good use of its limited-slip differential for better traction of its four wheels in precarious situations, while QTII relies on the vehicle’s antilock braking system to slow down or stop spinning wheels for maximising grip, which could reduce forward motion. Both are great systems and the difference likely won’t be noticeable on paved roads, but Quadra-Drive II is slightly superior for off-roading. The Trailhawk also features FCA’s Quadra-Lift air suspension, although specifically programmed for duty in this off-road version of the Grand Cherokee. It offers more articulation and suspension travel, and with it, ground clearance can reach 274 mm or 10.8 inches. On the road, the suspension absorbs cracks, bumps and potholes with poise. 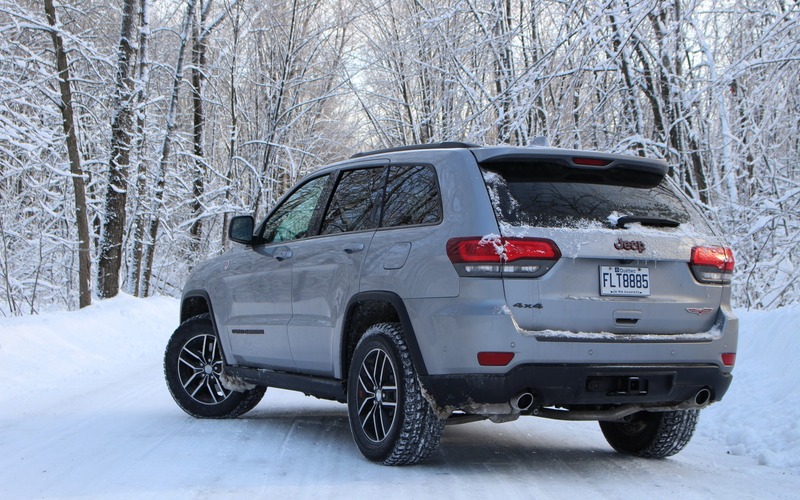 On snow- and ice-covered surfaces, the 2017 Jeep Grand Cherokee Trailhawk felt extremely sure-footed, and that makes its driver confident as well. That’s definitely the benefit of a full-time AWD system. The downside is higher fuel consumption because of the extra friction of the mechanism working on both axles. Not that it really matters when we choose the 5.7-litre HEMI V8, because any notion of fuel economy goes straight out the tailpipe. Obviously, with 360 horsepower and 390 pound-feet of torque on tap, performance is considerable, accompanied by the usual spine-tingling engine sounds. We averaged 14.0 L/100 km over the course of our test, which isn’t surprising. There’s an Eco mode that’s always on—basically a cylinder deactivation system—unless we shut it off with a dash-mounted button, although activating the Sport mode already takes care of that. FCA touts the HEMI V8 as being “a four-cylinder model of efficiency when cruising,” which isn’t the case. For more reasonable performance and fuel consumption, the Trailhawk comes standard with a 295-hp, 3.6-litre V6. It will do the job nicely, although we can’t expect a major gain in fuel economy as the vehicle checks in at just under 5000 pounds (2200 kilograms). Towing capacity is rated at 6200 pounds with the V6, 7200 pounds with the V8, among the best in the mainstream midsize SUV segment, up there with the Volkswagen Touareg. The EcoDiesel 3.0-litre V6 isn’t offered in the Trailhawk. The 2017 Jeep Grand Cherokee Trailhawk benefits from a blacked-out cockpit with black and silver trim as well as leather and suede seat upholstery with red contrast stitching. The lower plastic panels on the dashboard look and feel a little crude, and some details don’t live up to the Jeep’s price, such as the chrome strip that loosely overlaps the centre stack storage bin and console, but overall, the execution is more than acceptable for a Jeep product. On the other hand, the Uconnect 8.4 infotainment system is hard to beat, there’s little to criticise about the climate and audio controls, and there are plenty of power outlets and USB ports for keeping our portable devices fully charged. One thing that could use improvement is the windshield wiper control, which requires the driver to let go of the steering wheel and twist the end of the turn signal stalk. A right-hand stalk with an up-and-down motion is best when we’re driving in bad weather. Space is pretty good both up front and in back, although the middle passenger will find the seat cushions a little firm. In addition, the rear seatbacks easily fold down to create a flat and wide load floor, so the Grand Cherokee is a pretty versatile SUV. The 2017 Jeep Grand Cherokee Trailhawk starts at $57,245 before freight and delivery charges. That places it midpack among trim levels, below the more luxurious Overland and Summit variants. Standard features include a heated steering wheel, heated and ventilated front seats, a remote engine starter, a 12-way power passenger seat, a power tailgate and a nine-speaker Alpine stereo. Our loaded tester was also stuffed with adaptive cruise control, forward collision warning, lane keep assist, bi-xenon headlights, a panoramic sunroof, a power-adjustable steering column and a rear-seat entertainment system with dual screens and Blu-ray player. Total: almost $68K. That undercuts similarly equipped luxury SUVs such as the Mercedes-Benz GLE, the BMW X5, but feels more like a premium product than a Ford Edge or a Nissan Murano. For its combination of comfort, versatility and off-road prowess, the Trailhawk might actually be the Grand Cherokee of choice right now. It’s not as reliable as a Toyota or a Lexus, and the optional V8 engine will gouge its owner at every gas station, but it’s arguably Jeep’s best overall product. Too bad so few people will actually go off-roading with the Grand Cherokee, but knowing it can might be enough to impress the neighbours.